PHILADELPHIA, PA--(Marketwire - April 14, 2010) - Aberdeen Asset Management Inc. ("Aberdeen") has today been confirmed as the title sponsor of the prestigious Dad Vail Regatta, which will become the Aberdeen Dad Vail Regatta. The competition is the largest intercollegiate rowing event in North America and is held annually on the Schuylkill River in Philadelphia; this year's competition takes place over May 7-8, 2010. The 2010 Regatta expects to see in excess of 3,500 rowers take to the water from over 100 colleges and universities throughout North America. Aberdeen has signed a four-year agreement with the Regatta Organizing Committee, which will see them be title sponsor of the event until 2013, the event's 75th Anniversary. Aberdeen's support has helped to ensure that this prestigious Regatta remains in the heart of Philadelphia. The event's goal of athletic achievement associated with academic prowess aligns well with Aberdeen's corporate aims and is a sound foundation for the organizations to work together over the coming years. It complements other initiatives Aberdeen has established for fostering young talent in their sporting and educational endeavors elsewhere in the world. "The City of Philadelphia, Dad Vail Regatta organizers, the rowing community and Aberdeen Asset Management Inc. look forward to hosting all of the great activities on the Schuylkill River this spring in Philadelphia, home of the event for over 50 years," said Philadelphia's Mayor Michael A. Nutter. "Through the generous support of Aberdeen, a world renowned asset management firm with strong ties to Philadelphia, we can strengthen our commitment to an annual tradition that's widely regarded as the finest rowing competition in the United States." Commenting on the involvement in the Aberdeen Dad Vail Regatta, Martin Gilbert, Chief Executive Officer of the Aberdeen Asset Management Group, said, "We are honored to be associated with this long-established event, and are delighted to play our part in ensuring that it remains in our own U.S. hometown of Philadelphia. The competition is hugely popular not only in Philadelphia but throughout the collegiate system across the United States and Canada." "At Aberdeen, we are proud to have our North American headquarters in Philadelphia, a city that is known around the world for its hard work ethic and dedicated sports enthusiasm. We are thrilled to support the Aberdeen Dad Vail Regatta, a major U.S. sporting event taking place in the City for the next four years. " For more information about the Aberdeen Dad Vail Regatta and to watch Aberdeen's first 60-second TV commercial in the U.S., celebrating its involvement with the event, please visit www.aberdeen-asset.us/dadvail. This and 30-second advertisements also break this evening on Bloomberg TV and locally on CBS 3 (KYW), ABC 6 (WPVI) and Fox 29 (WTXF). The Aberdeen Dad Vail Regatta is the largest college and university regatta in North America. It was founded to encourage rowing on college campuses having fledging programs unable to compete against larger schools mostly in eastern United States. Today it is regarded as the "National Championship" of emerging college programs. In raw numbers the event draws now over 3,000 athletes, and over 500 boats to compete (2007) versus a mere 132 in 1974. The Regatta takes place annually along the Schuylkill River in Philadelphia. Aberdeen Asset Management Inc. is the wholly-owned U.S. subsidiary of Aberdeen Asset Management PLC ("Aberdeen Asset"), a global investment management group which is headquartered in Aberdeen, Scotland, and manages more than $230 billion of assets for both institutions and private individuals (as of Dec. 31, 2009). The group employs over 1,800 staff across 26 countries worldwide. Philadelphia is home to our Aberdeen Asset's U.S. equity and fixed income investment management teams, as well as our U.S. client servicing, consultant relations, business development and other operational staff: more than 180 employees in total. It manages and service over $42 billion in total assets on behalf of North American and international clients. The firm was recently ranked #3 out of 61 fund families based on its mutual funds performance during 2009 in a Lipper/Barron's Fund Families Survey. Aberdeen is also proud to be one of the supporters of the British Garden at Hanover Square, New York. This New York City park celebrates historic ties of friendship and unity between the U.S. and the UK. Aberdeen has a long standing association with university rowing competitions having sponsored the Oxford vs. Cambridge University Boat Race in the UK from 1999 - 2005. The company also continues to support the Aberdeen University Boat Race in Aberdeen, Scotland, in their annual event, which takes place every February. Partnering with mutual fund tracking firm Lipper, the Barron's mutual fund family survey ranks best overall fund family performance with distinct weightings for each fund category reviewed: 41.42% for U.S. equity, 14.49% for world equity, 16.27% for mixed equity, 23.16% for taxable bonds and 4.66% for tax-exempt bonds. Fund returns are measured against those of all funds in its Lipper category and do not reflect any sales charges or 12b-1 fees. All fund rankings listed are based on Barron's review of 61 Fund Families. Aberdeen Funds are distributed by Aberdeen Fund Distributors LLC, Member FINRA and SIPC. Investors should carefully consider a fund's investment objectives, risks, fees, charges and expenses before investing any money. To obtain this and other fund information, please call 866-667-9231 to request a prospectus, or download a prospectus at www.aberdeen-asset.us. Please read the prospectus carefully before investing any money. Investing in mutual funds involves risk, including possible loss of principal. There is no assurance that the investment objective of any fund will be achieved. 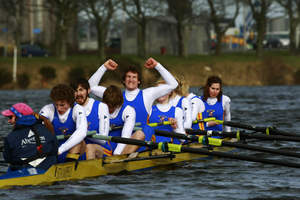 Winning crew in the Aberdeen University Boat Race, 2010.